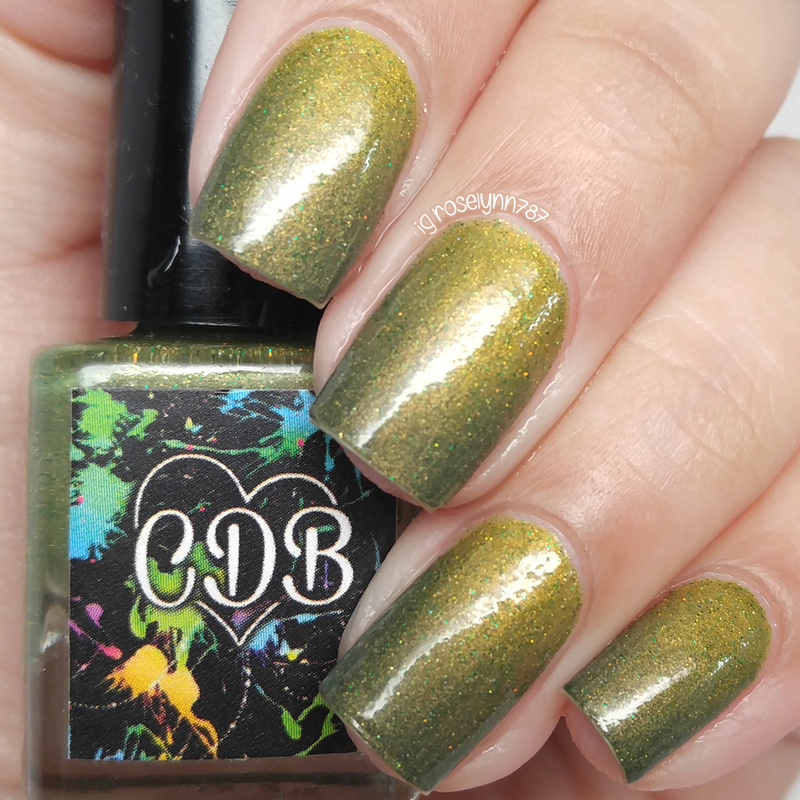 The March LE from CDB Lacquer released today March 1st for pre-order and retails for $11.00 (including shipping). The listing will stay open until March 11th and then this polish will no longer be available for purchase. As I mentioned, the March LE custom is a thermal! Now thermals have been a long time favorite kind of polish for me and it has become something that CDB Lacquer excels in. Something I have come to realize though is that a lot of you guys don't know about thermal shelf life. Unfortunately thermal polishes do not stay thermal forever and most have a shelf life of 6 months to a year. Of course, there are variants that will either increase or decrease the life of your polish. I'll have all this in a separate post, but in my personal experience CDB Lacquer thermals have lasted me a little over a year and still color change. 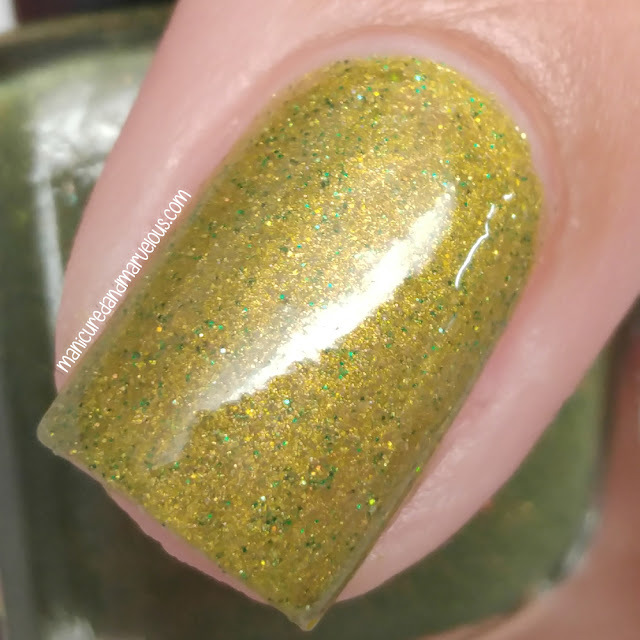 The March LE can be described as a shifting green gold thermal polish with holo gold and green micro glitters throughout. The formula was a bit on the thick side, but was manageable with the thin coats I applied. A light hand is definitely needed during the application to lessen any clumping (especially at the tips). The finish dries to a semi-texture due to the glitters, but ends up smoothing out with topcoat. Shown here are two coats sealed with a glossy topcoat. Even though I am not normally a fan of green polishes, I cannot deny my love for thermals. The color change alone is enough to make me fall in love. It's definitely a very unique color change in my collection and not to mention it's perfect for St. Patrick's Day! To recap, the March LE from CDB Lacquer is now available for purchase through pre-order and retails for $11.00 (including shipping). The listing will stay open until March 11th and then this polish will no longer be available for purchase. Oh. My. Gosh. This is the most amazing color-to-color transition polish I've ever seen. Gorgeous!! Your photos are perfect. I know, it's a bummer thermals don't last, but I've heard varying time lengths and some say they are still good to go years later when they check. What a unique colour combination. So pretty! This is gorgeous. It's not a color I gravitate towards but I really like the gold/olive warm state. This polish is gorgeous in transition! The warm state reminds me of my birth stone, peridot. Looks gorgeous on you. This wouldn't look so great on me unfortunately. This is stunning. I just got my first polishes from this brand recently. Can't wait to play with them. That is an interesting thermal. I love the cold stage, but not a fan of the green in the warm one. Not a colour I would go for but it looks lovely on you! We had snow today lol we seem to be going back into winter! What a perfect combo for St. Pat's! The gold shift is especially beautiful - it reminds me of a tiger eye! What a totally fun polish!!! What a beautiful shift, that seems like a shade that would wear well all year! You had me at olive green! I need this!! This is a fantastic transition and I didn't know that about thermal polishes!